We’d love your help. Let us know what’s wrong with this preview of Alan Cole Doesn't Dance by Eric Bell. But Alan’s got a new host of problems to face. His biggest one: Ron McCaughlin. Ever since Alan revealed he’s gay, Ron has been bullying Alan with relentless fury. Yet Alan can’t tell his parents wh Alan Cole is not a coward. Not since he stood up to his brother. Not since he let his friends Zack and Madison into his world. And deﬁnitely not since he came out at his school. To ask other readers questions about Alan Cole Doesn't Dance, please sign up. CvC, round two? Not quite, but Alan Cole Doesn't Dance does expand on certain themes from Alan Cole Is Not a Coward as the twelve-year-old moves deeper into his seventh-grade year at Evergreen Middle School. The students now know he's attracted to guys rather than girls, as does Alan's brother Nathan, but their parents remain in the dark. Alan's father has backed down a bit on his tyranny, and Nathan no longer bullies Alan, but home life is still tense as Alan's father awaits a promotion at work CvC, round two? Not quite, but Alan Cole Doesn't Dance does expand on certain themes from Alan Cole Is Not a Coward as the twelve-year-old moves deeper into his seventh-grade year at Evergreen Middle School. The students now know he's attracted to guys rather than girls, as does Alan's brother Nathan, but their parents remain in the dark. Alan's father has backed down a bit on his tyranny, and Nathan no longer bullies Alan, but home life is still tense as Alan's father awaits a promotion at work and takes out his frustration on the kids. At school, Alan continues to pine for Connor Garcia, who isn't attracted to guys but treats Alan decently. Ron McCaughlin, after learning about Alan's sexual orientation, has ratcheted up the bullying, and is becoming a serious threat. Between home and school, the drama is a lot for Alan to handle. "(I)f you're going on about changing the world, you need to know what you're doing. Or else you'll change it for the worse." Evergreen Middle School is prepping for its Winter Dance, and though Alan fantasizes about going with Connor, he knows that's out of the question. His attention is diverted by an announcement from Gladstone Art Academy, seeking applications from kids. Gladstone accepts students for a six-week course once every three years, and Alan would love to learn from their world-class instructors. His father is unimpressed: why is Alan fixated on art when he could develop skills that will make him popular with the girls? Gladstone is also way overpriced, he insists, but Alan's mother refuses to back up her husband this time. He wavers on his firm "no", but if he's going to shell out that kind of money, then he wants Alan to take June, his boss's middle-school daughter, to the Winter Dance. It will help secure Alan's father's job promotion. Can Alan stomach going on a date with a girl, much less June? Ron's aggression toward Alan turns dangerous, but Connor turns the tables. He's not attracted to Alan, but he won't let Ron abuse him. Zack Kimble, Madison Truman, and Alan were an inseparable trio in the previous book, but when popular Meredith Wood asks Madison to the Winter Dance, he starts drifting away from Alan and Zack. Alan's school routine is interrupted by Odin Thompson, a new student who doesn't get a good first impression of Alan. Odin, an artist, has his sights set on attending Gladstone Academy...which accepts a maximum of one student per school. Alan and Odin can't both qualify, making them natural rivals. Contentious as their relationship is, Alan detects a spiritual symbiosis between him and Odin. Art is their emotional release valve, the way they express turmoil over dark incidents from the past and their growing uncertainty for tomorrow. Maybe Alan and Odin can help each other heal. With Ron's threats escalating, Alan's father reverting to heavy-handed parenting, and the Winter Dance rapidly approaching, the stage is set for an encounter that will reveal the true Alan Cole, regardless of whether others like what they see. Alan has more growing to do, but he's not going to hide away as he does it, and he's blessed with an excellent support system to ease him through the rough patches. Alan made me cry. He did it again with his innocence and good nature and his courage to be himself without having to endure bullism. Standing for himself and for all the people that don’t have the strength to do it. Defeating evil with kindness, with his art, one step at a time. To see the difference you want to see in the world, you have to start somewhere, right? If you don’t do anything, nothing will change, and that’s exactly what Alan thinks and why I love him so much. I adored this little book so much. I couldn't put it down, finished it in one afternoon. Alan is the sweetest of boys and Odin was a great addition to the narration. Odin and Alan were the cutest together; from "rivals" to art buddies. Smiles and laughter they didn't share with anybody else, a past and present not so easy. Innocent and sweet. My heart couldn’t take all the adorableness. Alan’s friends, his family, things aren’t always great; they fight, because for things to get better, a little confrontation is necessary. I was lucky enough to get an advance read copy of this book. It was fantastic! This is the follow-up to the first Alan Cole book (Alan Cole is Not a Coward). Now that Alan is “out” to his entire school, he’s dealing with the aftermath: bullying, uncertainty, understanding friends who don’t quite “get it,” and a new mysterious kid who may or may not hate him. Not to mention that Alan’s former bully brother may or may not still be a bully, and Alan’s parents still don’t know he’s gay. Oh, and Dad’s I was lucky enough to get an advance read copy of this book. It was fantastic! This is the follow-up to the first Alan Cole book (Alan Cole is Not a Coward). Now that Alan is “out” to his entire school, he’s dealing with the aftermath: bullying, uncertainty, understanding friends who don’t quite “get it,” and a new mysterious kid who may or may not hate him. Not to mention that Alan’s former bully brother may or may not still be a bully, and Alan’s parents still don’t know he’s gay. Oh, and Dad’s big promotion rests on Alan dating the boss’s daughter! In addition to a great plot, the characters are wonderful. Alan is adorable in his endless optimism. His best friends, Zack and Madison, are slightly clueless on some things, but they are true friends. Odin is delightfully mysterious. Even the bully, Ron, is more than just a bully. I actually felt sorry for the guy... even while hating him. Alan Cole reminds me a bit of Nate from the Better Nate than Ever books and that’s a really good thing. His family is still kind of the worst and I’ll never understand that dynamic and a world in which twelve year old boys have fights and use words such as “hypercritical” and “gall” feels wholly unauthentic, but Alan’s ultimate message of fighting war with kindness wins every time. I was so fortunate to be able to read an early copy of this book-and even in its infancy it was fantastic! But when I got my advance reader copy, I was even more impressed. Great follow-up to ALAN COLE IS NOT A COWARD. Thank you to Eric Bell for providing an eARC to #collabookation for review. I'm going to start by saying if you haven't read Alan Cole is Not a Coward yet - do it. Like, stop reading this review and get a copy of Alan Cole is Not a Coward. That's your priority. I'll wait. So now that you've done that, and read it, you're welcome. And now that Alan and his brother are ok, the family unit is working to be less dysfunctional, Alan has supportive friends, and he's admitted to his school (and crush) Thank you to Eric Bell for providing an eARC to #collabookation for review. So now that you've done that, and read it, you're welcome. And now that Alan and his brother are ok, the family unit is working to be less dysfunctional, Alan has supportive friends, and he's admitted to his school (and crush) that he's gay, everything is wonderful, right?!? Well, Alan is not a coward, but he is still working his way to knowing who he is. And how to be who he is. And there is still Ron, the kid who goes out of his way to torture Alan at every possible opportunity. Alan's friends, too, are trying to figure out what being gay in middle/high school can look like. All of this is to say that Alan coming out was not the end of his story. And I'm so grateful. In Alan Cole Doesn't Dance, Alan is able to put down the defenses and struggle with who he is, what he stands for, and what is most important to him. I love love love reading male protagonists who model thoughtfulness and introspection. I don't know if boys get enough role models of that, and it's so necessary. 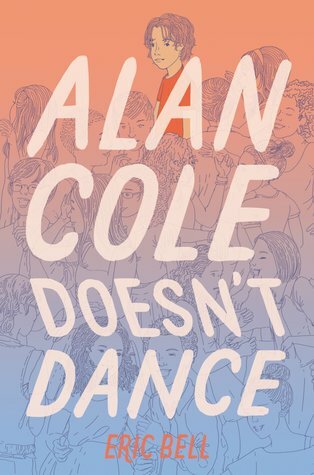 #AlanColeDoesn’tDance is the second book in this underrated but AWESOME series about a kid who is bullied for being gay and still manages to see the best in everyone, including his tormentor. I just adored the first book by #EricBell and I have quite a few students who did, too. Here are the strengths of this series: hilarious situations followed quite quickly by serious/sad moments that tug at your heartstrings, a trio of friends that can withstand anything, a complex family life that I rarely see represented in #mglit and a realistic story of #lgbtq🌈 acceptance and (unfortunately) homophobia. Alan Cole is one of the bravest characters in #mglit. This series belongs on every middle school library shelf. .
i actually think i enjoyed this one more than the first book, but i’m just a little bit outside the intended audience to enjoy it as much as i could. alan seems like a sweet kid though and i’m glad he tried to tackle bullying on an even larger scale in this book. he’s a way more courageous 12 year old than i ever was. I really enjoyed reading about Alan's new journey and it was really funny how yesterday's enemies are today's allies. Also, I liked the fact that Alan and his friends grew up a little bit since the previous book. Quite a refreshing read, I could say. Totally made my boring Monday a little bit more fun and intriguing. I seriously could not lift this down. This book is wonderful. Anyone who is being or has been bullied should read this. I wouldn't be at all surprised if this ends up being on a school reading list. I wish people could just be accepted for who they are and get along. I cheered Alan as he tried to find a way to make this happen. Alan Cole rocks! Love this book! The power Alan finds in himself to step up to bullies, defend his friends, and stand up for who he really is and his beliefs is heart-warming and inspiring. Focusing on kindness and the true identity of friendship and family, with lots of humor and great character personalities, Alan Cole Doesn't Dance follows the path of finding your identity in true middle-school style. The best book I have ever read. Somehow Eric Bell catches the emotions and hardships that any bullied kid is feeling perfectly. Its breathtaking, emotional and all around an outstanding read. I 100% recommend it. More humour and heartbreak and the most adorably awkward junior-high flirting ever. This is an amazing sequel to Bell’s debut novel. Alan is just as brave as before, and we see how his honesty and ability to stay true to himself affects him and those around him. Highly recommend! !